Skeuomorphism in UI is defined as something that uses real life 'metaphors' to help people get familiar with a completely new interface, its that part of the design which is meant to convey confidence to the user, that what he is deleting will go into a sort of digital trash-can, that an app is a digital notepad of sorts where you can write things, its the interface to on which hinges the app's usability. its a part of design more than it is of the aesthetic. Flat Aesthetic: Its not an interface, its just a method of conveying an interface. There is nothing like Flat UI. It is only Flat Aesthetics that we talk about when we talk of Flat UI. Flat Aesthetics are a way of conveying skeuomorphic or non-skeuomorphic elements. A graphical user interface (GUI) was designed in the early 1980s to help the humans get familiar with a computer. A command line interface couldn't achieve that. Skeuomorphic elements like a trash can were put on the screen to tell people where to put their discarded files, a pencil generally denoted an option to edit, a ticking clock meant you had to wait. The same happens when we design an interface for a touch-screen. We need to convey our message to the user and for that sometimes, the use of metaphors is necessary. Buttons on a computer screen are so much more different than buttons on a touch screen. A touch screen is usually controlled by our hands (which are less precise in pointing than our hands) while we use point and click devices like a mouse on a computer screen which are more precise. Using a text button on a computer screen can be helpful because pointing at a text button on a website with a mouse becomes much faster than pointing at a glyph button on a website. Things get reversed on a touch-screen, our fingers occupy a larger area, they need larger buttons and for that a glyph button is much better. Its like the Serif vs Sans Serif Debate, Sans Serif is much better on a computer screen while Serif is much better on a printed paper. The same's with Glyph buttons and text buttons. Until recently I wasn't really interested in typography analysis, Myriad Pro was as good for me as Helvetica. Frankly I didn't even know what a serif was! 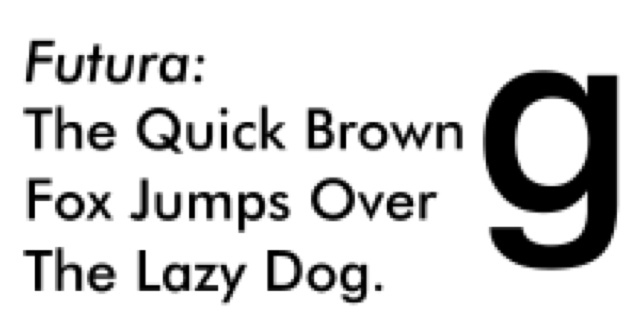 But just a few days ago when I reading a post by Dave Wiskus regarding the design of his new app Vesper, I was fascinated to see just how many fonts they actually went through to choose the 'right' font. I was intrigued! The first thing i wanted to know about fonts was The difference between Sans Serif And Serif Fonts. I did a bit of Wikipedia search to find out much more about it. This image explains the basic difference in a serif and Sans Serif font. On computer screens serifs tend to be disproportionately be larger and harder to read than in print. Hence the general inclination towards sans serif. Sans Serif is more legible on a computer screen. However in Print, Serifs tend to be more legible and are highly preferred as body text fonts, while sans serifs aren't really good for print reading. Hence, what Helvetica is to computers, Times New Roman is to the printed text! Neo Grotesque: These are Modern Sans Serif Typefaces. The Most commonly seen Sans Serifs today belong to this category. Humanist: They are the most Calligraphic of the four types and are also the most legible of all the sans Serif fonts. Geometric: These fonts are based on perfect circles and squares. Slab Serif: These fonts have little or no difference in thick and thin lines and their serifs are usually as thick as the vertical lines, giving them a bold look. As I walked out of the theater, there was a group of young university student's talking about how boring the movie was. Evidently, they didn't like the movie. They couldn't have been more incorrect than that. The movie isn't boring. It isn't bad, rather its awesome. Its steady & being steady turns out to be great for the movie. Set in the early 1950s West Bengal with the Zamindari system on the way out. Lootera is a story about a Zamindar whose land is to be used for excavating for clues of a new civilization by an employee of the ASI. What follows next gives this Movie a Romantic & Thrilling turn and talking about the plot any further will give spoilers. Craftily directed, Lootera isn't about loud dialogue exchanges or much action or about animated (excited) characters. Lootera is crafted with soft voices, beautiful landscape which play an important part of the story as well and long pauses which convey much more than what melodramatic dialogues would. The music as well has been blended with the background score giving the movie its extra edge. 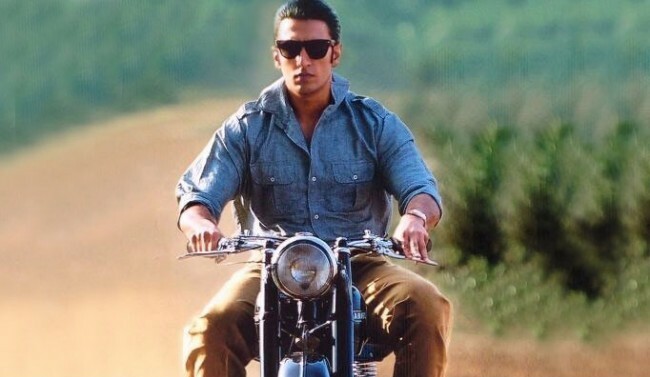 The meticulous use of the landscape, silence and dialogues by the director is what makes Lootera unique to its genre. While the first half's based in 1950s' West Bengal with a steady and even pace and has largely a romantic edge to it, the other half's in Dalhousie with a slightly more thrilling turn of events giving the movie a slightly faster outlook. Actors, Ranveer Singh & Sonakshi Sinha play their parts wonderfully. Its Ranveer Singh who was earlier seen in Band Baaja Baarat, who surprises with his acting skills and does wonders to the character of Varun. Vikrant Massey as Ranveer's friend is witty and charming while Adil Hussain performs his role with finesse. Amit Trivedi's Background Score and Soundtrack is brilliant. Its perfectly blended into the movie. The Music sticks to you even after the movie in a good way. This one's an award winning performance by the young National Award Winner. Mahendra shetty's cinematography is picture perfect & infuses life into the movie. Its the cinematography which makes this such an enjoyable experience. Dipika Kalra's editing is snappy and is just about right & with a running time of 135 minutes the movie never stretches too long. The 1950s set creation is also perfect, from the Old Benz to the character's attire, there's a lot of detail in there. The most talked about point of Lootera will be its pace. Its quite a steady pace. Some might even consider it slow. But the slow pace gives the movie a calm environment to portray its story which Much unlike Barfi where I found the movie slow for an unnecessary show of artistic tapestry and some heavily plagiarized and recycled humor only suitable for 6 year olds or so. Here the calm surroundings and long pauses convey a deep meaningful story. Lootera is a must watch and probably the best this year. Specially the end, which leaves you with a smile as you walk out. This one's surely a masterpiece by Vikramaditya Motwane. I couldn't really find anything wrong with the movie apart from the fact that some might not appreciate the steady pace. Going with 9/10 for Lootera. "Can a CIA Exfiltration specialist's bizzare plan of rescuing 6 american refugees from Iranian Revolution pull of?" "This sounds so bizzare, that it might actually work!" ejacuates one of the characters at one point in the movie. The mere idea of saving 6 American refugees from Iran was so bizzare that anyone would ask if it could ever happened. And yet it did. The very fact that its a true story makes the movie more spectacular than it is. There's a constant sense of tension that keeps building with the ticking movie, even though you can kind of predict what's going to happen in the end. 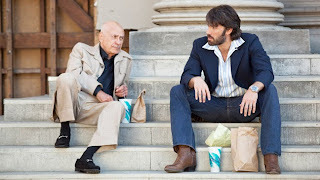 Here comes the tough job of being a thriller movie for Argo, even with a predictable plot, Argo manages to create the thrills with its music, acting and some superb editing which all together make Argo a gripping tail of exfilteration if not surprising. The screenplay & editing great here. The shift from a tense refugee environment to a hollywood setting on the sets of Star Wars to a CIA. The transitions are just the right kind and at right moments. Seldom hitting a false note, Argo is both evenly paced & entertaining, the hollywood part could have been snappier though. 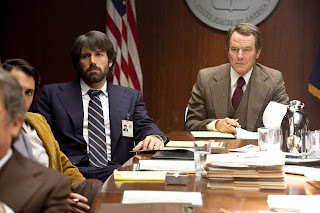 Argo's a true story iron-cast to be adapted into a movie Its probably the simplest most exciting plot one could think of for an exfiltration mission thriller & yet its all true not much was cooked up. Watch Argo for some superb performances & an entertaining and thrilling movie.